His is one of the most extraordinary acting careers of the century of cinema. 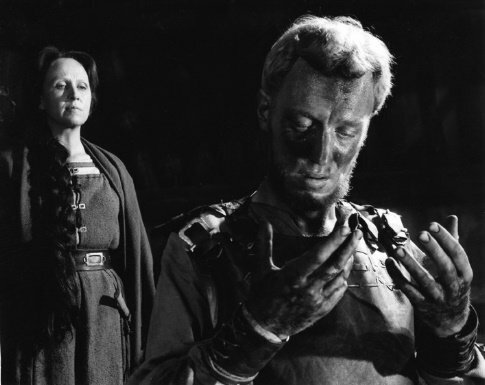 According to IMDB, Max Von Sydow has no less than 137 film credits to his name, beginning with Alf Sjöberg’s Only a Mother (1949) some sixty years ago. Since then, the iconic roles speak for themselves: the aged Father Merrin in The Exorcist (1973), chess-playing knight Antonius Block in The Seventh Seal (1957), Töre the vengeful father in The Virgin Spring (1960), and a memorably villainous Ming the Merciless in Flash Gordon (1980). It is, of course, the collaborations with Ingmar Bergman that are best remembered, on stage as well as on screen, but it is the richness, variety and force of his many other roles which for me are demostrative of his extraordinary gift for character acting. He continues to work to the present day, recent highlights being a touching recent appearance in The Diving Bell and the Butterfly (2007), starring opposite Tom Cruise in Minority Report (2002), starring in Dario Argento’s neo-giallo Non ho Sonno (2001), and has just signed up for a recurring role in television drama The Tudors as well as the new Martin Scorsese picture Shutter Island. It seems extraordinary that a figure who found his most famous role more than fifty years ago, in a film which is such an iconic cornerstone not just of European cinema but of art cinema worldwide, still finds himself today doing important work, seemingly with a minimum of fuss. Grattis på födelsdagen, Max.